Despite two bannings and threats from a rival faction, Ni John Fru Ndi's version of the Social Democratic Front, SDF, finally held its rally and National Executive Committee, NEC, meeting in Limbe, over the weekend. With a mammoth crowd in attendance and a remarkable presence of security agents, Fru Ndi got down to the brass tacks the moment he took the podium.First, he fired off at his detractors and other individuals whom he termed as reckless, irresponsible, inefficient, empty intellectuals and empty people. The following names of individuals who are either no longer members of his faction or have been dismissed from the party such as Bernard Acho Muna, Chris Fomunyoh, Stephen Ngu Tita, Prof. Clement Ngwasiri, Alexander Taku, Christopher Nsahlai, Maidadi Sardou, Martin Nkemngu, Prof. Tazoacha Asonganyi and Basile Kamdoum, were hot on the Chairman's lips. "The pre-occupation of these people has always been that I (Fru Ndi) should step down. But I will step down if the people who make SDF tick ask me to do so, Fru Ndi remarked. "These individuals are not courageous, they are cowards. Why have they not corrected the mistakes they claim I have made in the SDF where they are now?" The rally turned out to be a score settling platform for, the SDF Chairman. If he was not condemning the "indiscipline in Cameroon" he was blasting people like Martin Nkemngu, former SDF Assistant Communications Officer who defected to the CPDM party last year. He said such people were inefficient, adding that the SDF was not for opportunists. "SDF belongs to the people and not to individuals. The SDF is out to serve and not to be served," he said. On his relationship with Bernard Muna, Fru Ndi said after two reconciliation attempts, he has been very jittery going in for the third.The Chairman did not spare his MPs and Mayors. He found some of them wanting in the execution of their responsibilities and warned that the party "will not tolerate MPs and Mayors with traits of embezzlement and acts of indiscipline." Democracy must be guided, he said. "In the SDF, we have practised democracy to a fault. People go to the Parliament to serve and not to be served," added.He, however, congratulated the first Limbe SDF MP, Victoria Ndando for what he said were her contributions and judicious use of Parliamentary grants during her sojourn in Parliament. "We have to register for the upcoming elections. We should go and register at the various registration centers. We will continue to fight," he said.Another issue that Fru Ndi handled was joining Biya's government. According to the Chairman, if Biya invited him, they would have discuss the modalities. As for Lebialem which sometimes is considered a problem for the SDF, Fru Ndi said: "We are working hard in Lebialem Division with SDF members like Ferdinand Asapngu and Michael Ndobegang. The Lebialem people are fine, but there are some bad ones inside. We will do our all to get all the Parliamentary seats and Mayors in Lebialem." He was hard in his condemnation of the breakdown of values in the country, corruption in the school milieu, the recent killing of some students in the University of Buea, UB, the dirty nature of Cameroonian cities and the ravaging impact of HIV/AIDS on the youths. 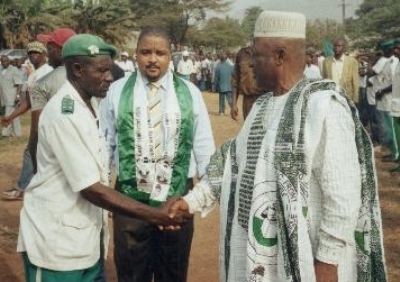 He told the crowd that Aladji Baba Danpullo, Chairman of Cameroon Tea Estates, CTE, confided in him that the problem with privatization of the tea sector of CDC was government's interference in the process. SDF Southwest Provincial Chairman Joshua Osih Nabangi, on his part, said the change in Cameroon will start in Limbe. "We did not come to campaign. SDF is stronger more than ever before," he noted. For me, I know that it was extremely successful in spite of all the hurdles that had been put in place by the administration. We are happy that everything went well. About the decisions taken, NEC members were reminded that the women must meet up their quota of 25 percent as far as elections are the matter. We have been charged to encourage other women in the party to know that it is their right to take up positions, which the party has guaranteed them. The two events have been highly successful. First, I want to react to a front page story published by you (The Post) that the SDO for Fako said the ban on the SDF had not been lifted. For goodness sake, if Yaounde had not notified him and he had read the other newspapers, which wrote and even gave the time of the rally, what stopped the SDO from telephoning the Minister of Territorial Administration, citing the newspapers? They were writing from information they got from Hon. Mbah Ndam who is a highly responsible SDF Parliamentary Group Leader. I think he could not have gone ahead to mislead the public. I blame the SDO for that story. He should have telephoned. The SDF Parliamentary Group Leader elected not to comment. He expressed dissatisfaction with the front page story in The Post's edition No. 0831 which stated that the SDO for Fako had maintained a ban on the SDF rally in Limbe despite MINATD's order lifting. He said the publication by The Post scared away of their militants from attending the Limbe rally. Despite initial threats by S.N Tita and other Muna sympathisers in Limbe that Fru Ndi was going to be stoned if he got to Limbe for any rally, this did not happen. S N Tita told The Post that the threats of stoning were empty; just to scare Fru Ndi away. He, however, said they only decided to give up their initial stance following a compromise deal which they reached with the DO of Limbe. Tita told The Post that the DO Peter Itoe Mbongo, advised them to give Fru Ndi his rally so that when they, the Muna adherents, would want to hold theirs, they would have no trouble. "The DO called for me and my colleagues and appealed to me that he was going to give a permit to Fru Ndi to hold his rally because his persistent applications meant that he had something to tell the people. So we told our militants not to go to the field and they obeyed." To Tita, the Limbe rally was a failure. "We have in the past had rallies here, with 10,000 people and not rallies with less than 1000 people." he argued. "The people have lost confidence in Fru Ndi," he said. I thought NJFN and his SDF pundits would be coming to Victoria to apologise to the Southern Cameroonian people, denounce politics of lies with la republique, join or form a freedom fighting movement to denounce the colonisation of the Southern Cameroons, etc since they know that they cannot win the CPDM with an election organised by ELECAM? Helas, I was wrong. They were merely continuing their campaign of flowering and colouring la republique’s corrupts junta as a multi-party democracy in the eyes of the international community as that is what they are paid for. This one statement posits that this man and his party are traitors. I frankly told you guys. I wrote here that these people are already masquerading as a political party and they are just ashamed to join La Republique’s government. Time will tell. How comes that a week after right-minded Southern Cameroonians were captured and jailed innocently for fighting for the decolonisation of the Southern Cameroons, the SDF can be holding political rallies in Victoria without questioning the presence and activities of colonial agents in the Southern Cameroons? How comes that their leader does not carry a meaningful message to his people to boycott elections organised by ELECAM, etc. Is ELECAM an independent electoral commission that they were asking for? The bitter truth is, these people, are fighting for their stomach with the invented trust that they are fighting for the poor and helpless. I am glad Southern Cameroonians are positioning themselves to disrupt the upcoming elections in their land as they have found that the present crop of political leaders masquerading as an opposition are merely Biya’s agents in the Southern Cameroons. The SDF and the Southern Cameroons political conciousness are contradictory rather than complementary as some scathing SDF pundits want to claim. While the SDF is fighting to colour la republique as a multi-party democracy in the international community, other groups (SCNC, SCYL, SCAPO, SCARM, etc) are fighting to regain the Southern Cameroons political consciousness that has been lost (since SDF started preaching a false political doctrine of containment with la republique francaise du Cameroun), our lost identity, etc and the eventual decolonisation of the Southern Cameroons. When a political party focuses on searching for spaces and relationships that can survive them from day to day, then right-minded people need to distance themselves from their activities. Politics in the SDF and most oppositions in la republique are almost always conducted as a craft with its leaders having invested much on themselves through a false political doctrine that they are like demi-gods, they are becoming heretical to challenge and a nuisance to our political conciousness. They came to Victoria, with a series of anecdotal doctrines. If you read their body language, you will realise that colonial agents to flower la republique Du Cameroun as a multi-party democracy are merely sponsoring them. We thought this was a left wing movement focused on the redistribution of wealth and resources towards the poorer and disadvantaged sections of society and secularism. Infact, the activities of these groups of people has coalesces into a viable conception that can be thought of as bandits. They are seemingly manipulating the general public in having their preferences shaped for them by those in power through the use of a false propaganda termed democracy and lies through the media. We must counteract their dogma of lies…. It is good to know that the rally and NEC meeting finally held in Limbe. S N Tita should be licking his wounds at this time. As the SCNC and other groups clamouring for the restoration of the idependence of Southern Cameroons go about their business, Anglophne Cameroonians in paricular and Cameroonians as a whole should be encouraged to have their names on voters lists so as to be able to vote the SDF to power (if the elctoral laws are good). Through the SDF, Cameroonians will have hope for a better future and the state of Fako-Kilum created to resolve the present issue of Independence for the SCNC. The SDF must not be seen as a stumbling block to the SCNC as some will like us to believe; the SDF should be seen correctly as having another solution to the Anglophone problem. IF YOU ARE AT HOME MAKE SURE TO REGISTER TO VOTE; IF YOU ARE IN THE DIASPORA, MAKE SURE TO CALL YOUR FAMILY BACK HOME AND ENCOURAGE THEM TO REGISTER. NOW IS THE TIME. The SDF is our thing,likewise is the SCNC. They are not rivals. We should concerntrate our energy to work out strategies that will lead us to success. while adherents of the SDF should be mobilising to mount pressure on Biya to put ELECAM in place before next elections, activists should think of how to mobilise the population to cause the released of detained Comrades. I strongly support the chairman that everybody should register, ready to vote. We cannot surrender to Biya and continue to suffer by simply saying that we are tired of elections that do not produce the results. Wow! Ni John Fru Ndi is really the man of the people. Though I must confess that the population has almost halved. I wish he joins the struggle for the liberation of the Southern Cameroons. If this guy does that then we'll be around gaining our independence. That is a good wish there.The Southern Cameroons should continue to give this support to their man,because through him they can smile one day.They have seen how indebted stone-throwing terrosists have been ignored.Akoson,do we really think Cameroonians are fools listening to this man for 17 years?Where are the people who have investments in Limbe? Defeated in Bamenda,they waited for Yaounde.Ignored during consultations for ELECAM,they camped out in Limbe.Disgraced in Limbe,what next? "...S N Tita told The Post that the threats of stoning were empty; just to scare Fru Ndi away..."
When I read the above statement, I could not help but laugh my lungs out. If Biya's heavily armed soldiers could not scare Ni John Fru Ndi from launching the SDF, then what would rocks (propelled from the hands of an octogenerian!) do? Jesus Christ, to change Cameroon we really have to be serious. I was there in Victoria. We arrived & learnt that SN TITA et al had fled to an unknown destination. After the rally & NEC meeting, the Chairman honoured an invitation from Eden Radio. For over one & a half hour people called to ask questions on the life of the party & his person. SN TITA et al never called or sent SMS to counter whatever the Chair was saying or had earlier said during the massively attended rally. Where then were these people to protect their investments? These people only exist on pages of newspapers. The earlier the Cameroonian press start practicing honourable journalism, the better for democracy & development in Cameroon. I'll be back with more from Victoria. What investments do they have? They're empty vessels. I wish I were there to witness the rally and the radio programme by Eden radio. This shows that veteran radios like the Ocean City has gone down the drain. They'd better sit up! Eden radio keep it up. But I thought your radio doesn't cover political programmes. I think it is wrong to call fru ndi "A fool" as tita morfaw did.U should know better than to call a man a fool. Fru Ndi has made some mistakes, i'm not denying that, but don't blame him everything bad that has happened to us.We all know Biya is tyrant stimulating all of our problems. He has a firm grip over the country making it almost impossible for any opposition party to challenge him.Anglophones need unity, not disunity. With disunity, we are weakening ourselves and that is exactly what La republique wants.What about other political parties that have been existing in Cameroon for ages like the SCNC? What have they done to tackle Biya's dictatorial regime? Everybody has made mistakes as the political scene is concerned.We are giving the enemy time to reenergize as we quarrel and attack each other. Instead of calling each other fools, let's cooperate for a brighter future.If anglophones cannot cooperate now amongst theirselves then we are all like the Biya regime we criticize every single day on this site. I think you misunderstood what Tita Morfaw wrote or maybe I am the one who has misundertood his write up. I think he didn't call Fru Ndi "A fool" as I have quoted from your posting below. "I think it is wrong to call fru ndi "A fool" as tita morfaw did"
Just read through his posting again. Sorry, the SCNC is not a political party and is not complementary with the SDF as the SDF is for La Republique and is registered and recognised under the laws of La Republique. The SCNC is a freedom fighting movement interested only in decolonising the Southern Cameroons. The only political party that has been registered under the Laws of the Southern Cameroons is SCAPO (Southern Cameroons Peoples organisation) and it does not contest elections in La Republique as it is not recognised there. Thus, you cannot compare the SCNC and the SDF as they are two contrasting not complementary organisations. As Klemenceau has said, you have not understood Tita Morfaw´s contribution. The fool he referred to is that fellow here who thinks he is more southern Cameroonian than any other person from southern Cameroons. The fellow who has turned down all pieces of advice to revise his strategy, yet he is advising the SDF to change strategy. It beats my imagination that he knows that one can listen to criticisms when he has obstinately refused to listen to others here. Thank you Klemenceau for straightening my point.I was surprise to see some one quote me that I called fru ndi a fool. Fon has clearly indicated who that statement refers to and I really don't like to call the name of this fellow because it gives him undue attention. My position is that the cameroonian populace (especially anglophones) are suffering and the cause of our problem is bad governance and a rogue dictatorship.SCNC and SDF are both committed in fighting this ill,though through different appraoches. why then should i call Ni John a fool? Even massa paul biya who is the monster I've not denigrated him then why do so to a true revolutionary? They say they want to ignore, then they cannot sleep and spend time gossiping Rexon. my deepest apologies tita morfaw, I have re-read your write-up and I now understand what you said.Please accept my deepest apologies again.And as for rexon, I strongly think the SCNC is a political party. If they secure the secession of southern cameroons will SCNC not assume power?will Nfor Nfor and the others not have big positions in the country? or are you saying that if SCNC secures secession, they will dissolve so that a "political party" should be formed? There are already politicial parties in the Southern Cameroons but those political parties are not registered under the laws of la republique. There is for example SCAPO which our members militate in but SCAPO do not contest elections in La Republique. When we will have our independence, we will form more political parties based on our constitution and will organise elections.